When reading through the phylogenetic literature, a split may be observed between those who favour maximum likelihood and those who consider Bayesian methods superior. Of course, a number of paper used mixed methods, but usual there is a tendency to either side. Interesting enough, in their paper describing the aLRT statistic, Anisimova & Gascuel (2006) present a figure which clearly shows the comparison with simulated data sets. This allows for a theoretical ‘fair-play’. Anisimova, M. & Gascuel, O., 2006. 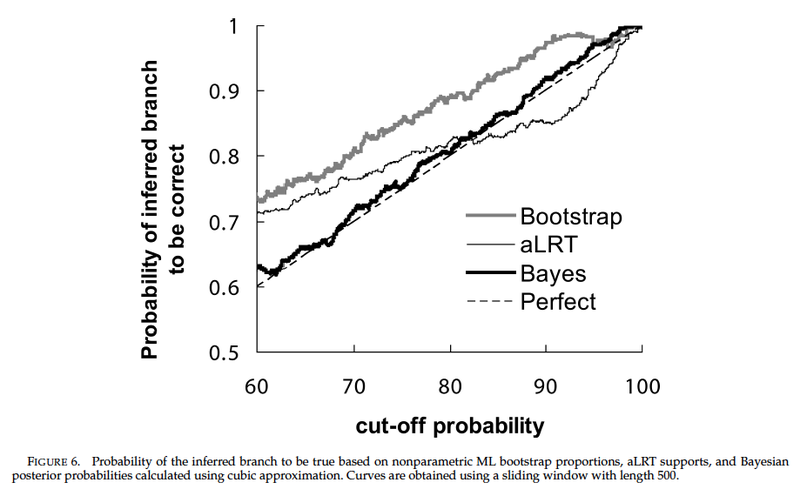 Approximate likelihood ratio test for branches: a fast, accurate and powerful alternative. – Systematic Biology 55: 539-552. This entry was posted in Uncategorized and tagged methodology, phylogenetics on February 18, 2011 by bramb.